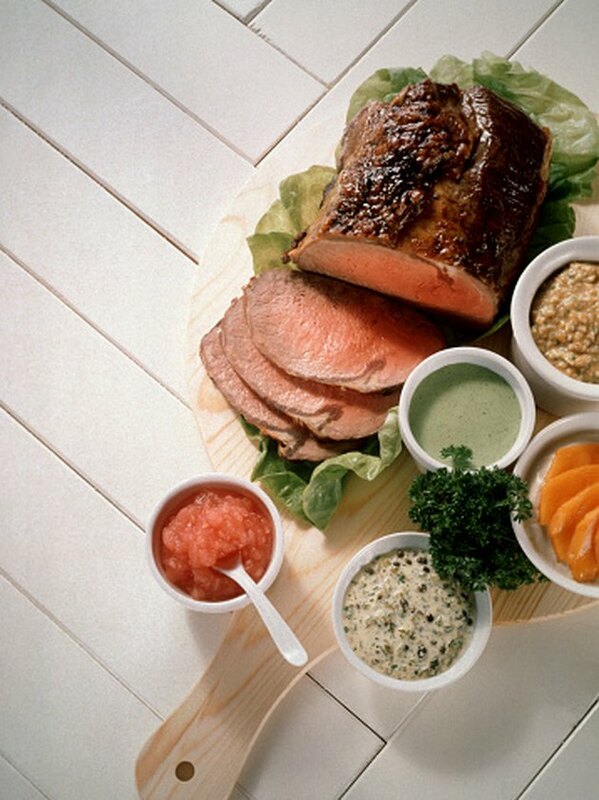 The lean eye-of-round roast has a mild flavor and little waste. Though similar in shape and compactness to the far more tender tenderloin roast, the eye-of-round roast has a much firmer texture. The lack of marbling makes this roast tough and potentially chewy, especially when it is overcooked. Monitor it carefully when grilling so you don't cook it beyond medium-rare, and cut it into thin slices against the grain to compensate for the potentially tough texture. When grilling, briefly sear all sides of the roast to create a complex, richly flavored outer layer, then use low and slow indirect heat to cook the middle without over-toasting the outside. Remove the eye-of-round roast from the fridge an hour before you grill it. The center of the meat cooks more readily when pre-warmed. Scrub the grill's grate using a grill brush or steel scrub pad, and apply cooking oil to the grate using paper towels. Preheat the gas grill on medium-high for 10 to 15 minutes, making sure that the cover is closed. For charcoal grilling, pile the charcoal into a stack or use your charcoal starter chimney and set the briquettes ablaze. Let them burn for about 20 minutes or until the pile glows red and they're covered with gray ash. Once they're hot, double layer all of the briquettes on one side of the grill. Add four or five black, fresh briquettes to the hot charcoal and put a drip pan into the grill in the empty part of the grill, below the grate. Swab the eye-of-round dry with paper towels just before grill time. Massage the meat with salt, pepper and any other seasonings your recipe suggests. If you are rubbing on more than a couple of spices, combine them in a bowl first, then grab pinches of the mixed spices and rub them deeply into the eye-of-round. Once seasoned, rub or brush olive oil over the entire roast to boost the browning. Place the eye-of-round directly over a gas burner or the hot charcoal. Brown one side for two or three minutes, then turn it using tongs and brown the other sides for two or three minutes each. Close the cover whenever you can. Turn off all but one of the gas burners and turn the remaining lit burner down to medium. Transfer the seared eye-of-round to a cool spot away from the burner. For charcoal grilling, move the eye-of-round roast directly over the drip pan on the cool side of the grill. Place an oven thermometer near the roast if your grill doesn't have a built-in thermometer or push an oven-proof thermometer into the thickest part of the eye-of-round. Grill the eye-of-round roast for 1-1/2 to 1-3/4 hours or until the internal temperature of the round reaches 135 to 145 Fahrenheit. Monitor the grill's temperature; if necessary, every 30 minutes put another three to five briquettes into the hot area of the charcoal grill so that you don't lose your heat as the charcoal burns down. Move the eye-of-round to a serving plate and tent it with foil for 15 minutes. It continues to cook, increasing about 10 degrees. It then starts to cool some and the protein coils loosen up, making the round roast more tender and allowing the juices to redistribute back to the outer layers. If you don’t have an oven-proof thermometer, use an instant-read thermometer to check the internal temperature of the eye-of-round roast. Maintain the internal temperature of the grill somewhere between 250 and 325 Fahrenheit as best you can.